Carcassonne is a city castle in France. Standing on a high hill, as if naturally raised from the top, stretches the largest fortress in Europe. Double walled, with thirty-eight towers that resemble the pointy hats of medieval fairies or ladies of the court, make a real impression of a fairy-tale castle. The feeling is reinforced by fairy bridges, wooden galleries, and inside the ancient fortress is located a cathedral, decorated with chimeras, stained glass with unique ornaments and huge stone slabs on the floor. Carcassonne is a city-castle, which played a leading role in many wars and is one of the few medieval cities still look just as at the time of its heyday during the Middle Ages. The main attractions of Carcassonne are the upper town, which is characterized by fortress walls, and the South Channel. Carcassonne is often called the stone book, because with its help you can easily trace the history of every age, of which it was witness. 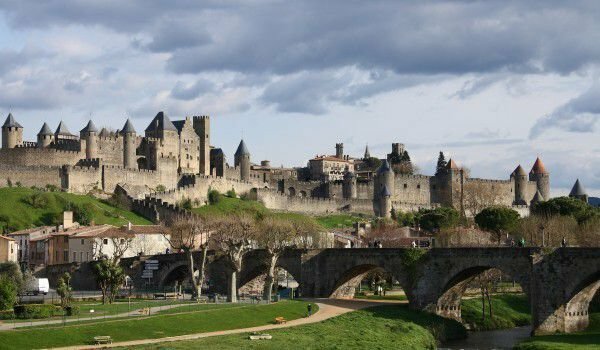 Carcassonne is a perfect example of military architecture history - from the Romans to the fourteenth century. Inside the fortress is a small city that has romantic streets, many shops and cafes. Souvenirs sold in the castle town are special - the most popular are bronze sundials with blue magic crystals, copies of old weapons, clay statues of saints and leather jackets - everything is as it was during the Middle Ages. In Carcassonne are often shot movies with knights themes. Walt Disney had lived long in Carcassonne and we owe some of the beautiful scenes from the animated tales of his company to this town. Today, in Carcassonne live more than 46 000 people. The name of the town comes from the times when Celts lived here. 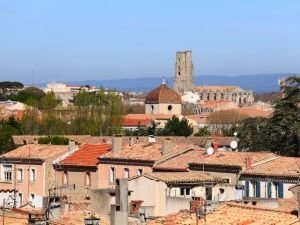 Carcassonne consists of two cities - Bastide St-Louis and the medieval Cité. Bastide St-Louis does not provoke much interest in tourists, but Cité is one of the biggest attractions in all of France. Visigoths built the interior walls in the fifth century and they withstood the attacks of the Franks. Legend about the origin of the city said that during the siege the city was on the verge of extinction due to a lack of food. Then one of the noble ladies within the fortress, whose surname was Carcas, collected all the grain she had, and let the pigs eat it in front of besieged troops. Franks then decided that the city has inexhaustible supplies of food and withdrew. Saracens managed to capture Carcassonne in the early eighth century, but were expelled later. In the twelfth century, the fortress walls are further strengthened. In the seventeenth century, the fortress lost its strategic importance. Gradually the castle started to turn into ruins in the nineteenth century but was restored to become a major tourist attraction. In the castle is located Comtal, which is a stronghold of the twelfth century. Castle tours are allowed, lasting no more than an hour. Among the city's attractions is the Basilica of St-Nazaire, which was built in the fourteenth century. The basilica has lovely stained glass and medallions shaped like a rose. The basilica was built in Roman style, in which are felt Gothic influences. The organ, put there in the sixteenth century, is recognized as the oldest in the southeast of the country.